‘The Manigault House (1803) is located near the center of the Charleston peninsula, at the corner of Meeting and John Streets. It is a three-story brick structure, set on a raised brick foundation. The main facade has a two-story porch across the center three bays, with elaborate doorways on both floors featuring slender pilasters and sidelight windows. A semicircular stairwell projects from one sidewall, and a bowed porch from the other, giving the house the rough shape of a parallelogram. The interior features delicately refined woodwork in its fireplace mantels, door and window moulding, and cornices, reflective of the style promoted by Robert Adam, which differentiated the scale of these elements in domestic and civic architecture.The gatehouse standing near the property entrance is an architectural folly.’ (Wikipedia). 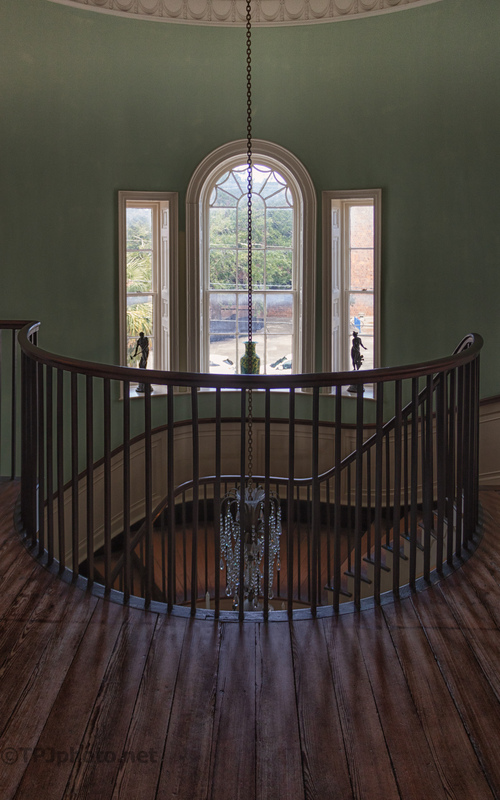 For me the focus of this house is the magnificent stairwell. The house centers around this and everything else is completely over shadowed. This is the first photograph of a series. Taken from the top floor landing.